For almost a year now, I’ve been reading and learning about a little newsroom in Connecticut making extreme moves (literally and figuratively) on the engagement front. This spring, I got a chance to see it for myself. The Register-Citizen in Torrington, driven by the vision and efforts of Publisher Matt DeRienzo, has shown the rest of us what it can mean to make community outreach central to what we do. (Outreach is one of my three categories of engagement. For more detail, see this presentation.) Journalists are creatures of habit and routine, and Matt is trying to change his staff’s fundamental outlook, starting with what they see when they walk into their newsroom. I’ll go over a few of the highlights of what they’re up to, and share some observations. — The newsroom is made to be visited. There are directional signs and instructions for participation by the front door. The Newsroom Cafe sells self-serve coffee and pastries. It includes shelves of used books for sale, free public wifi (not very common in Torrington, Matt says), and a lounge for TV viewing. Local photographs from a historic flood are displayed on the walls, along with art from the “artist of the month” program. There is truly no wall between the newsroom and the lounge/reception area. If you walk in, the heads looking around to see if you need assistance belong to the journalists, not just to the folks at the classified desk up front. Customer service is part of the job. — No, that doesn’t mean the newsroom is overrun by crazy folks who want to rant. That’s the fear so many of us seem to have about making ourselves accessible to individual community members — we think we’ll spend all our time fending off the conspiracy theorists. When I asked about this, the staff could come up with one time that a troubled reader came in, talked for awhile and had to be shooed out. That’s it. It’s important to recognize, of course, that Torrington is not a big community, and accessibility issues are on some level a matter of scale. What works at the Register-Citizen might not work up the street at the Hartford Courant. — Specific invitations to the newsroom are issued for community classes (on topics like blogging, shooting video and genealogy) and for daily news meetings, both of which are also live streamed. The three afternoon news meetings I attended had only a handful of people following along online, but it was clear the staff knew they had an audience. Several of them spoke directly to the online audience, looking into the camera. Others were careful about articulating clearly. When one viewer conveyed a question in the online chat, the managing editor answered directly. There was a “we’re on our best behavior” tone to the meeting that happens in other newsrooms when tour groups come through. — The classes and the Newsroom Cafe are managed by Kaitlyn Yeager, community and digital engagement editor. Matt also shuffled the staff and turned a reporter, Jenny Golfin, into a full-time curator. That’s two journalists on a staff of fewer than 20 who are focused on the audience experience. — A central theme to all of these changes is for the newsroom to be more outward-facing. A place to hang out, that the community can feel ownership of, like a public library or a community center. Being outward-facing also means giving the public access to things they can’t find anywhere else. Like microfilm machines that are easy and free to use, where visitors can print or email what they find. 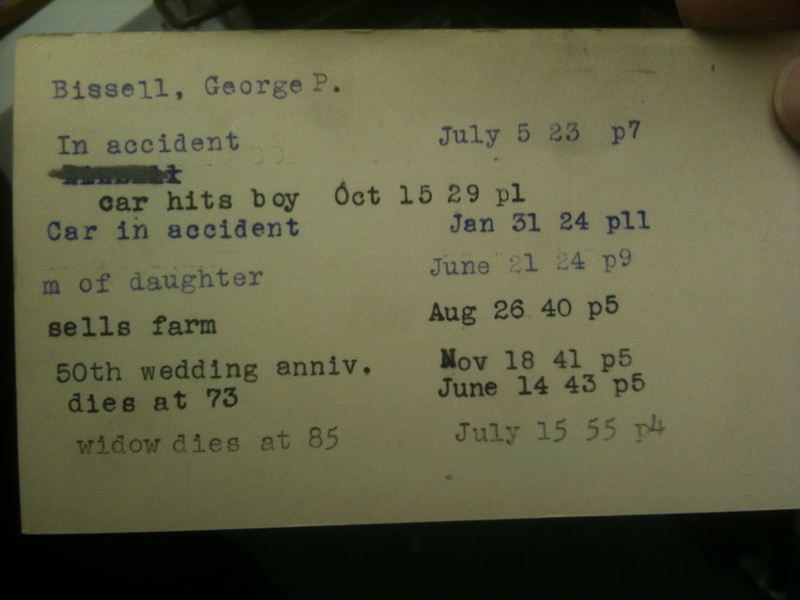 And an effort to type up the index cards that newsroom staff kept religiously from 1898-1985, tracking each time a name was mentioned in the paper. That’s an amazing resource that wouldn’t exist anywhere else, and the newsroom wants the community to be able to find it. — The real goal, though, if you ask the publisher, is to improve the journalism. A more connected relationship to the community and a focus on audience should, he says, lead to better-sourced stories, quicker responses to the news and more useful storytelling formats. He considered it a victory, for example, when a reporter mapped road closures without being asked. I knew most of this before showing up. During my three days in the newsroom, I wanted to get a sense of buy-in — of whether the staff is on board, or resistant, or ambivalent. I did not find vocal resistance. Instead I found very little hesitation, and a large dose of deference. Matt, Editor Rick Thomason and Managing Editor Emily Olson have a fairly young staff of reporters. That’s both a benefit and a drawback, as I know from my years as an editor at the Columbia Missourian, a newsroom with a staff of students that churns every 16 weeks or so. The inexperience sometimes leads to more errors and a lack of depth and sophistication in the journalism — problems Matt says his paper faces as well. But it also means the staff is more likely to accept experimentation, to adopt a new reality and to change routines. I heard from several staff members that the Newsroom Cafe idea seemed totally normal. Why wouldn’t ALL journalists interact with people who walk in off the street? Live stream their budget meetings? Offer community classes? That’s just what it means to be a journalist. It’s part of the routine. A side effect of having a staff that is fairly young and not particularly plugged into the overall journalism industry is that they’re in large part NOT showing up for work every day ready to change newspapers, experiment radically or make a statement to the industry. They’re just putting out a newspaper. When asked about the motivation behind the changes, most gave full credit and responsibility to their boss and his boss, and only a few seemed to spend much time reflecting on what they were doing, and why. In several cases, I knew more about how the changes had come about and what the paper was trying to achieve than the staff member I was interviewing did. I’ll be eager to check back with the Register-Citizen in a few months. They’re hopeful that warmer weather will drive more traffic to the Newsroom Cafe, which saw just a handful of folks on each of the days I was there in early April. (The courthouse soon to be built across the street will no doubt make a big difference, too.) They also have a new editor in Rick, who has a big-picture view of what this little paper is doing and is there specifically because of it. The culture of experimentation, while it might not be a part of how every individual staff member is approaching the journalism, is firmly in place, from the leadership in this newsroom all the way up to Journal Register Company CEO John Paton. Stay tuned. Pingback: OnlineMagazine » Blog Archive » Is John Paton the savior newspapers have been waiting for?